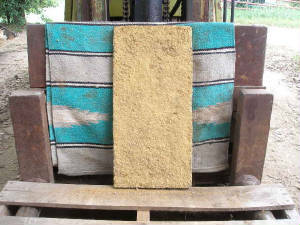 Selling Our Cottonseed mealcake on the web going on nearly 30 Years.. Always closed on Saturday and Sundays and holidays. For all you weekend campers staying at the Calhoun Falls State Park on Beautiful Lake Russell. You can call'um and see if they have some in stock to make sure you catch plenty of fish during your visit. Don't wait, it sales quickly. Orders can also be placed from this web site or you can purchase from Amazon.com or Ebay and other fine stores across America. on time and delivered without a lost !!! none. Check out the FYI page for answers to the most asked questions over the last 30 years. 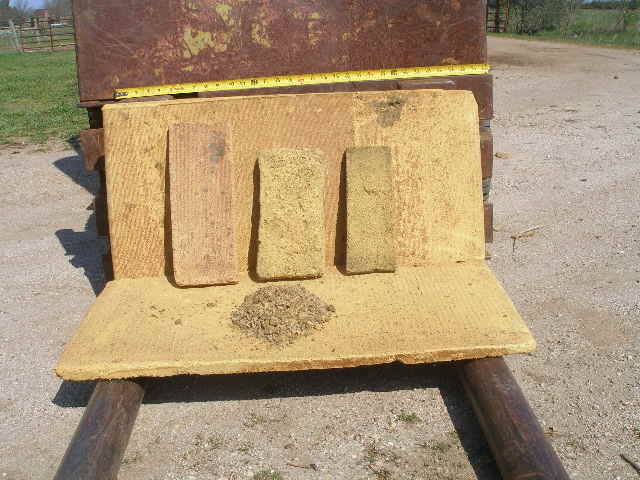 We make, sell and ship Our cottonseed mealcake to anywhere IN THE USA. click here on blue link or on picture for product page. (South) Carolina CottonSeed MealCake Slabs are cut up, packaged & shipped to any USPS address in the U.S.A..
All of the real cottonseed oil in the cottonseeds is left in our Carolina cottonseed mealcakes. This is the best designed and the longest lasting cottonseed meal cake on today's market..
Great for Drawing CAT Fish, Crappie, Bream, Bass (yes Bass), Bait Fish & Carp! You just have to figure which kind of fish you want.. Hang it out by your dock or throw it in your favorite Fishing hole. to draw and keep fish where you want them.. Fish can only nibble off of it. For trout lines? yes... You will need a saw and drill! I am a third generation offspring of this business and the 9th generation to carry on in this area. We evolved from cotton farming, cotton ginning, and raising crops and then ranching. Carolina Meal cakes Slabs are mixed, loaded, and pressed with over 5 different added foods that all fish love. This meal cake feeds the bottom, top and in the middle of the fish food chain. EXTRA food is added just to attract minnows and bait fish. This one is available at Amazon just click on picture. and $16.20 for the USPS 12 x 12 Flat Rate box. USPS charge went up to $18.85 on this box, I haven't. You save an extra $2.25, for now. These Flat Rate shipping charges are included in our prices listed. Please clear your browser's cache if the Add To Cart button doesn't work for you. You can skip pay pal and use your own credit card there if you don't have a Pay Pal account. Order By Mail ?? Here's How.. If you want to order by mail, just send a check, or money order and a note with what you want off the web site, and a email address if you can. This was the last bale of cotton I ginned in our family's cotton gin. 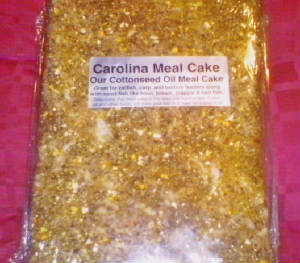 Carolina Cottonseed Mealcake food and fish attractant. For fishing baskets or hanging out around docks or just throw it in and bait a hole. No holding bag is needed ! Nothing to add, it's already in the mealcake! Fish have to eat on it to make it go away..And it won't be falling apart or disappear when it touches water like some others do. Thanks in advance for your order..
You can reach us by any one of these E-Mails below for more Information.